306 pages | 7 Color Illus. | 139 B/W Illus. Magnetic nanoparticles with diameters in the range of a few nanometers are today at the cutting edge of modern technology and innovation because of their use in numerous applications ranging from engineering to biomedicine. A great deal of scientific interest has been focused on the functionalization of magnetic nanoparticle assemblies. The understanding of interparticle interactions is necessary to clarify the physics of these assemblies and their use in the development of high-performance magnetic materials. This book reviews prominent research studies on the static and dynamic magnetic properties of nanoparticle assemblies, gathering together experimental and computational techniques in an effort to reveal their optimized magnetic properties for biomedical use and as ultra-high magnetic recording media. "A compendium of contemporary experimental and computational research on magnetic phenomena, Magnetic Nanoparticle Assemblies provides excellent insight into the compelling issues at the forefront of the discipline. The breadth of topics that are addressed in this text, contributed by some of the leading researchers within the field, will be of useful reference to students, scientists, and engineers working at the frontier of magnetism within nanoparticle ensembles." 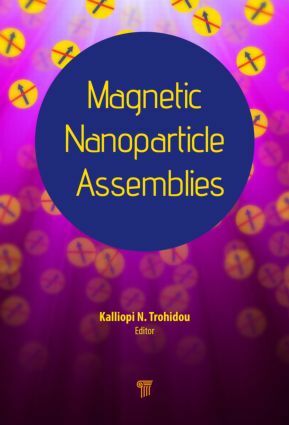 "This book is a well-balanced collection of review articles, by well-known specialists in the field, on intrinsic and collective effects on the equilibrium and time-dependent properties of assemblies of magnetic nanoparticles. It covers a great deal of experimental and numerical work together with some of the most promising applications. It is a valuable addition to the series of textbooks on the interplay between intrinsic and collective behaviour in nanostructures." Kalliopi N. Trohidou received her PhD from the University of Athens in 1988 with funding from the Greek Atomic Energy Agency, the British Council, and the Rutherford Appleton Laboratory. She worked in Great Britain as research fellow at the Rutherford Appleton Laboratory (1988–1989) and the University of Reading (1989–1990). From 1991 to 1993 she was research fellow at the Institute of Materials Science in NCSR Demokritos in Athens and then professor in the Department of Physics, Chemistry and Materials Technology at the Technical University of Piraeus (1993-1995). Her current research interests are theoretical studies and computational modeling of nanostructured materials. Dr. Trohidou has published more than 80 articles in scientific journals and several chapters in books. At present she is deputy director of the Institute of Advanced Materials, Physicochemical Processes, Nanotechnology and Microsystems and head of the Computational Materials Science group.